As Kendrick Lamar basks in the limelight, his TDE brethren have been sharpening their lyrical blades in the background waiting for the perfect opportunity to make their presence felt. Jay Rock claims to be re-discovering his sound, while ScHoolboy Q and Ab-Soul continue to put in work on their latest projects. 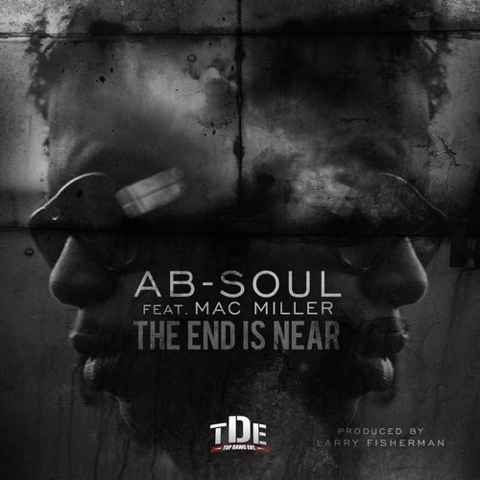 To quell the demand from his ever-growing fanbase, Ab-Soul released a track earlier today featuring Mac Miller called "The End Is Near." I have never been a huge fan of Mac, but he holds his own. The song could very well have done without a feature though, because the beat sounds like what we've come to expect from a Soulo record. It's unknown whether or not this song will appear on Ab's new project, but personally I hope it doesn't. Nothing wrong with tossing out a few tracks every now and then to keep fans happy. Peep the link below and let us know what yall think! Is Mac Miller as annoying to yall as he is to me? I mean he is lyrical, but his words are lost behind his pre-pubescent vocals.